A jet stream forms high in the upper troposphere between two air masses of very different temperature. The greater the temperature difference between the air masses, the faster the wind blows in the jet stream. 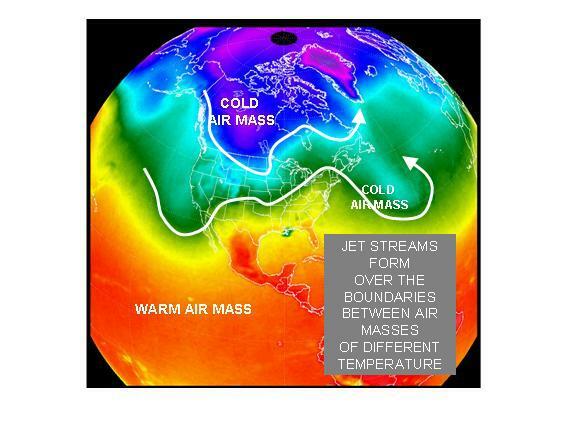 But how does the temperature difference between two air masses cause the jet stream? Since colder air is more dense than warmer air, there is an air pressure difference between them at any altitude. And if the warm and cold air masses are quite deep, higher altitudes in the atmosphere experience progressively larger air pressure differences. Since it is horizontal air pressure differences that cause wind, this leads to very strong winds. But at some altitude high in the troposphere, the temperature difference reverses, and as you progress higher the winds then decrease. The altitude at which the winds were strongest is considered to be the jet stream level. So, the strongest jet stream winds then occur between air masses having the largest temperature differences over the deepest layer of the troposphere. 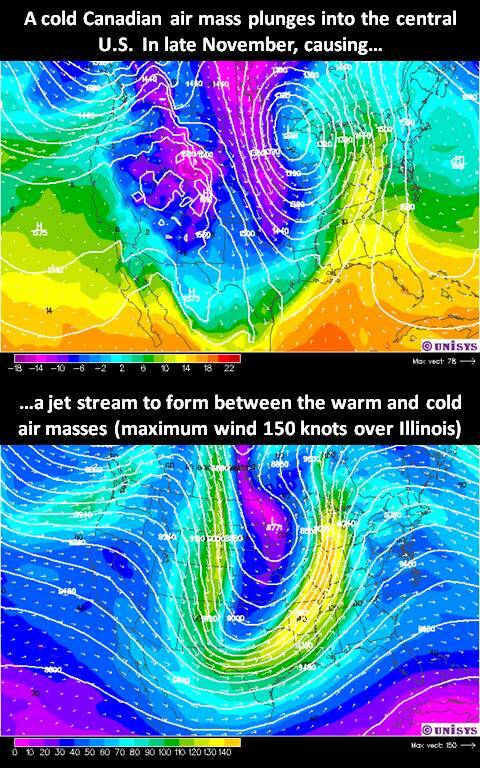 Contrary to popular belief, the jet stream does not "cause" weather conditions of a certain type to occur. Its existence is instead the result of certain weather conditions (a large temperature contrast between two air masses). AIRPLANES FLYING BACKWARDS?Just how strong the winds can be in jet streams was discovered during Word War II, when American bombers tried flying from the U.S. to Japan and found they couldn't make any progress flying against the strong winds. Today, aircraft routinely adjust their altitude to either fly with the wind in the jet stream, or move to a different altitude to avoid flying against it. WORLD RECORD WIND SPEED The highest wind speed ever recorded on the surface of the Earth was 231 mph on April 12 1934, atop Mt. Washington, New Hampshire. This high-elevation weather station experienced the winds of an extremely strong jet stream that had descended to the top of the mountain.